Use this side by side comparison guide to compare the best manual die cutting machines. 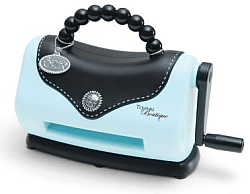 The Sizzix Texture Boutique Embossing Machine is a machine designed only for embossing, so you won't be able to cut with this machine. It embosses just about up to 5 inches wide. 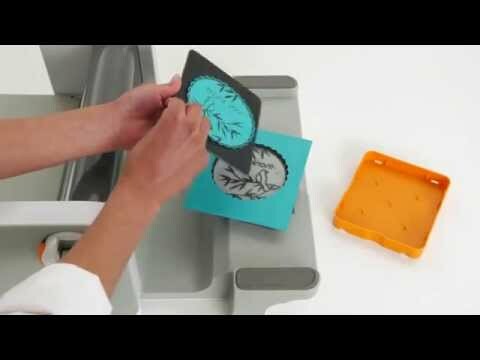 The Cricut Cuttlebug is a popular machine that can cut and emboss up to 6 inches wide. It folds up to save space and the bottom suctions to whatever surface it's on, providing more stability. Different spacer plates make the machine compatible with most leading folders and dies. The Evolution Advanced die cut machine is one of the cleverest machines on the market. It can cut and emboss up to 6 inches wide and use dies and folders from many different manufacturers. The machine comes with a dial setting to set the pressure of the rollers, eliminating the need for shims and confusing sandwiches. The crank handle can also be removed and swapped out for a motor. The sides have built in storage and fold up when not in use. When the sides are open, the base suctions to the table, providing support when cutting. 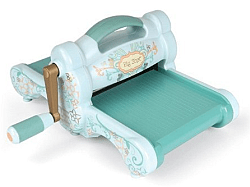 The Sizzix Big Shot is an award winning machine that can cut and emboss up to 6 inches wide. It does not fold up but has an extended multipurpose platform, which allows for more working space. The Big Shot contains solid core steel rollers and gears and has a unibody cast roller housing. Works with dies and folders from other manufacturers. 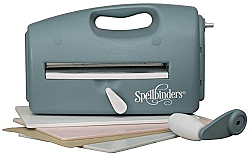 The Spellbinders Grand Calibur can cut, emboss, and stencil. It has a large 8.5 x 12 cutting mat, so it can fit full-size pieces of paper. It suctions to its surface for greater stability. It also works with dies and folders from other manufacturers. The Spellbinders Platinum comes in two sizes. The larger machine that can cut up to 8.5 inches wide, and the smaller machine cuts up to 6 inches wide. The machines have a solid steel core making them very durable. The machines are able to cut up to 8 layers using the steel rule dies. Although the Platinum machines are big and heavy, the sides fold up saving some space. Best for: Durability. The larger machine works with full size paper. The Fiskars Fuse Creativity system is discontinued but is still a fairly popular model that is worth a mention. It has a large 12" wide opening, and can not only cut and emboss but also letterpress, which is a process of making inked impressions. 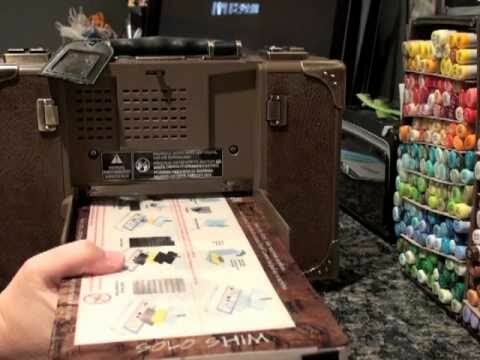 The Vagabond machine is a neat machine that folds up into the shape of a suitcase, making it more portable. It can cut and emboss up to 6 inches wide, and it is motorized. Because it has a strong motor, one must be careful not to get the machine jammed by inserting sandwiches that are too thick. Drawbacks: Have to be careful not to jam plates. 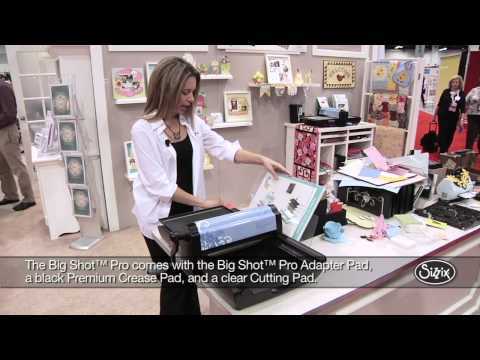 The Big Shot Pro is a rugged machine that has a 13-inch wide opening. 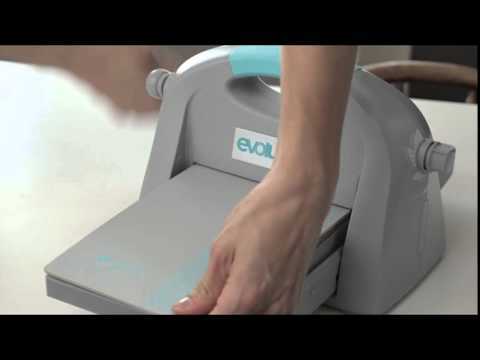 It works with every Sizzix and Ellison design ever made and almost every die on the market. The extended platforms make it great for cutting large pieces of fabric. It comes with a 3-year limited warranty. Will you please review the Lifestyles (aka WRMK] Evolution Advanced manual die cutting machine. What machine would be best to cut both paper and fabric? I would like to have it be easier to do my English Paper piecing. Hi Penny, all the machines listed on the site will cut fabric and paper. What other features are you looking for? Goodluck! 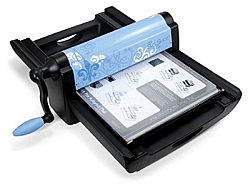 I have been go ogling like crazy I’m trying to find a GOOD BUY, AND I came across.Sizzix Fabi Personal Fabric Cutter Machine…… THIS IS JUST AS GOOD AS ANY OF THE SIZZIX LINE BUT WAS MADE FOR FABRIC VS. PAPER. Just FYI ? Which machine cuts house templates (I want to make Putz houses) AND cuts word stencils (to make signs)? Which is the best machine for cutting tweed fabric 4 layers at a time or more? I love this website, I am a beginner and a Mother of four lol. 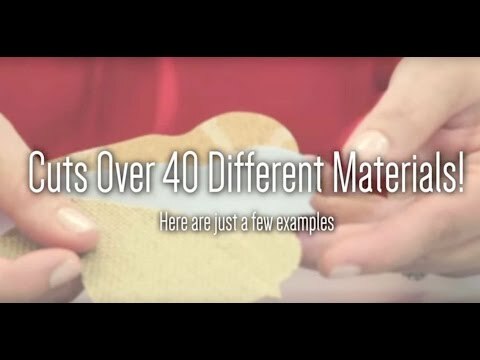 Trying to find an affordable die cutting machine. I am involved in Facebook groups and we make die cuts and pocket folders and flip books and swap with our partners from group. Currently I am using my neighbors cricut machines which are nice but I need one for my own home, non digital. I Appreciate your page because I never heard of most of these machines until now and I appreciate any information you can post in the future because it will take me quite some time to afford one even the cheapest one. Hi! We’re looking for a machine for our small business that would cut felt shapes and possibly punch holes in them as well. We make felt sewing kits. would you recommend a machine that could do both? if there is one? We started looking at digital but if we want to do more at a time, perhaps manual is the way to go? This is my question as well….which machine would work best when cutting felt shapes for school art classes….bulk cutting?